Viewed by Larry Gleeson as part of the 2018 American Film Institute’s AFI DOCS. The film was screened in the National Archives Museum in Washington, D.C. The Cold Blue, a Vulcan Production, is a gripping story of the bravery of youth and a meditative reflection on the surviving members of WWII bombers, directed by Erik Nelson. 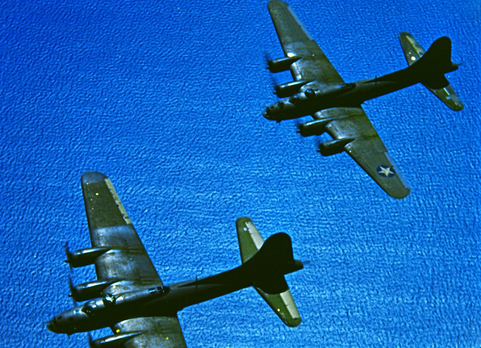 Nelson based The Cold Blue on footage shot by William Wyler (The Best Years of Our Lives) and three cinematographers flying with the 8th Air Force during WWII bombing missions over Europe and into Germany for a documentary on the Memphis Belle, a B-17 bomber. In assembling his film, Nelson effectively employed restored archival footage, textual overlays, still photography and present day voice-over narration from surviving members of the 8th Air Force. Sadly, one of the original Wyler cinematographers perished during the WWII footage collection when his plane went down over France. Interestingly, more men died flying missions in World War II than were killed fighting as United States Marines. In all 135,000 men flew over three million missions over Europe. A B-17 formation, often referred to as a flying fortresses, was capable of carrying two tons of bombs over a distance of a thousand miles. During WWII, the flying fortresses would make their run into Germany and after releasing their bombs, the aircraft would turn around and fly another five hours to return home. An average mission took eleven hours. The crews’ bombing accuracy placed approximately one-third of their payloads within 1,000 feet of their intended targets. Adverse weather conditions would negatively impact their accuracy, however. The men who piloted and crewed these aerial war ships lived together, ate together and flew together on a minimum of 25 missions. The age range for most of the men were 19-25 years old. Most, if not all, were family men and feared daily for the loss of their lives. The odds of surviving all 25 missions was 25%. Roughly one million Germans, with an estimated 40,000 guns, laid in wait for these men and their planes. By 1945, 12,731 B-17 had been built with 5,000 being lost in the war over Europe during the same time frame. In late 1944, the Allies decided, in order to bring the war to a close, to transition from a precision bombing campaign to a pattern bombing campaign that destroyed 3.6 million German homes, killed over 700,000 thousand Germans and wounded another 780,000. Moreover, 7.5 million Germans were made homeless. Pattern bombing succeeded in bringing about the German surrender and shortened the war by a full year. In closing the film, the surviving members of the 8th Air Force downplayed their hero status and expressed why they wanted their story to not only be told, but to be heard – so that young men and women would not have to endure what they experienced in the cold blue where temperature inside their ships ranged from 20 degrees on a warm day to -60 degrees on a cold day. The film was dedicated to the 28,000 men of the 8th Air Force and to Cinematographer Harold Tannenbaum who gave their lives in service. While The Cold Blue lacks some of the cinematic overtures of Christopher Nolan’s Dunkirk, Director Nelson weaves a powerful, linear, human interest narrative. David Hughes adds an excellent sound design mixing diagetic and non-diagetic elements that add to and augment the evocative story line. In addition, the cameras inside the plane offer an unparalleled access to a live, combat air mission with a death-defying mise-en-scene. Moreover, the restored, archival footage quality is quite good after being in storage for 70 years. The Cold Blue is a warmly recommended film and as with the award-winning Dunkirk, The Cold Blue is best experienced on a large screen. I like this movie Cold Blue! It inspired my patriotism. The film is a real story recorded by a war director in his own life. This is very touching my heart. The film is divided into several paragraphs to describe but what happened. The pilots of World War II were very hard and hard. The country that protects it does not hesitate to pay for its own life. I hope that this film will remind people now that our peaceful life and beautiful country are guarded by these heroes, and we hope that people can cherish it.